Recently, CBS renewed five of their freshman series, including Kevin Can Wait, Man with a Plan, and Bull. But what about The Great Indoors? Should the network renew the comedy series for a second season? 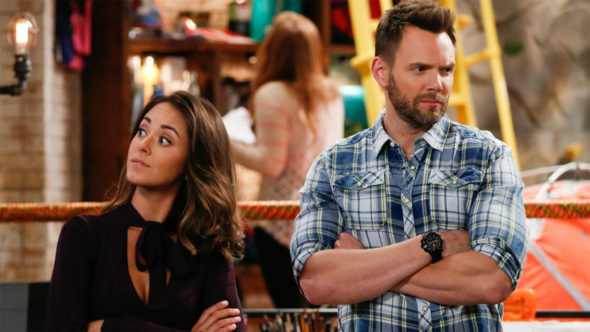 The sitcom follows an adventurous magazine reporter (Joel McHale) whose world is turned upside down when the magazine goes online-only and he’s assigned to head the digital department. The cast also includes Stephen Fry, Susannah Fielding, Christopher Mintz-Plasse, Shaun Brown, Christine Ko, and Chris Williams. So far, season one of The Great Indoors has performed pretty well in the ratings. The season is currently averaging a 1.50 rating in the 18-49 demo and 7.30 million viewers, making it one of the network’s top five scripted shows for the 2016-2017 season (in part because it follows The Big Bang Theory). However, despite decent ratings, CBS did not include the sitcom as part of its recent renewal announcements. Could that mean the show will be cancelled? What do you think? Are you a fan of The Great Indoors? Do you think CBS should cancel or renew the series? More about: CBS TV shows: canceled or renewed?, Quick Questions, The Great Indoors, The Great Indoors: canceled or renewed? Definitely should be renewed. Stephen Fry’s bits are absolutely priceless, and the lampooning of the younger generation is just hilariously on point. It should be dumped but like shows like Kevin can Wait which are rubbish are renewed so will this load of infantile garbage will probably get another series . Renew it. One of the few good sitcoms on today. Heck, one of the few good sitcoms this century. Please renew. Funny show. Love Joel McHale. Love the inter-generational back and forth banter. Interesting , different characters. Please renew. Cancel please. Totally lame & disrespectful to pretty much anyone’s intelligence. Just the commercials were enough to make not want to watch it. Please cancel this show. Please cancel. It was never any good, and it is insulting to millenials. No one with that much education can be that stupid.